a) FOREIGN / NRI/ PIO/ SAARC/ ASIAN/ AFRICAN Nationals. Agriculture Biotech, 2. Agril. Economics, 3. Agronomy, 4. Botany and Plant Physiology, 5. Entomology, 6. Extension Education, 7. Plant Breeding and Genetics, 8. Plant Pathology, 9. Soil Science. B.Sc. / B.Sc. (Hons) Agriculture (4 years course)/B.Tech (Biotech)(4years course) for M.Sc. (Agril. Biotech.) Course Only, with minimum 60 % marks or 7.0 OGPA on 10 points scale or equivalent. B.Tech (Agril. Engg.) 4 years course with minimum 60% marks or 7.0 OGPA on 10 points scale or equivalent. B.Sc. (Home Science/Community Science) 4 years course with minimum 60 % marks or 7.0 OGPA on 10 points scale or equivalent. 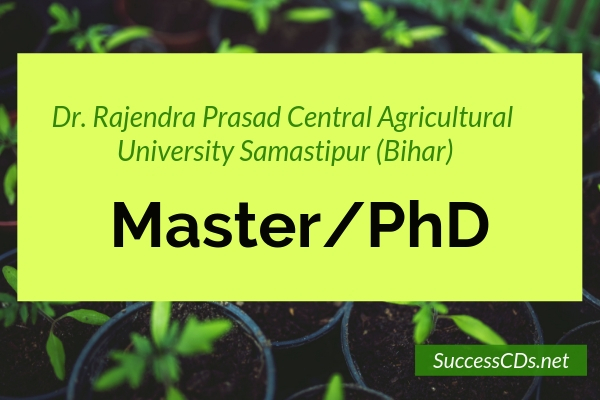 Bachelor’s degree (4 years course) in Agriculture & Allied sciences with minimum 60% marks or 7.0 OGPA on 10 points scale or equivalent. (a) Academic Attainments (Record) Weightage for academic attainments (High School to terminal degree) would be 70%. The weightage for interview is 30%. Candidates will be called for interview in the ratio of maximum 1:4 (No. of seats: No. of students called for interview). Selection of candidate will be based on academic score as per guideline framed by the University and personal interview. The weightage of Academic score and personal Interview will be 70: 30. The entire process will be done through a selection committee. Final selection will be based on cumulative score. The decision of the university selection committee will be final. All the Ph.D. Candidates will have to show a powerpoint presentation on his future work plan. A student selected under this category will have to abide by all the rules and regulations applicable to a student under normal category. Note: Food, travel and other personal expenses are not included in this fee which will be payable in INR. Candidate will have to apply through Email ( in a single PDF only). The desirous students will submit their duly filled application form along with self attested documents mentioned below, through Email dyregistrar.acad@rpcau.ac.in. Names of the candidates shortlisted for interview in Master/Ph.D. programmes will be published in RPCAU website. The interview may be held through electronic media/ video conference / Skype and shortlisted candidate will be informed accordingly on their email. The residence in the hostel is compulsory for all students admitted in this programme. The persons entering India on student visa / Research Visa for higher education will b eligible for admission. They must obtain NOC from the ministry of external affair, Govt. of India. i. Self financing – Applicants can directly apply to RPCAU, Pusa Samastipur, Bihar, India subject to clearance from DARE/ MHRD, Govt of India. ii. Foreign candidates holding Govt. of India scholarships seeking admission as ICAR nominees. iii. Foreign candidates sponsored by their governments with scholarships seeking admission as ICAR nominees. Admission will be made in accordance with the terms and conditions laid down in the MOU agreed between RPCAU, Pusa, Samastipur, Bihar , India and the concerned university / Institute abroad. v. Students under cultural exchange fellowship programmes. Those students seeking admission under the cultural exchange programme of Government of India are required to approach the Indian Council for Cultural Relations (ICCR), Azad Bhawan I.P. State New Delhi, India need to follow the application process laid down by ICCR (www.iccr.gov.in) and apply using the application form stipulated by ICCR, in the event of their selection, the Council will be informed about their selection. Before the confirmation of admission, candidates have to produce their certified academic details and financial viability certificate by the guardian/parents of the candidate to meet out the university course fee.